A little over a month ago I wrote on this blog that I was going to "refrain from posting what Stevie G calls 'emotive polemics based on half truth and rumours' on the MUFC Ltd forum ... and will try to bite my tongue, as it were, if/when Drax continues his 'Taylor-isms' in the Advertiser"
However, following the Advertiser's double-page "Magpies' in Crisis" feature which, last week, left even the normally hyper-opinionated Chris Raine lost for words, I've had a couple of emailed requests to offer my take on some of the quotes attributed to the Manager and the Chairman. Last league win at York Road? Monday 30th August 2010. Last league win full stop? Tuesday 30th December 2010. Just the 15 league games, then, without a win! "Drax: Quitting has never been an option" was the headline of the article that gave us the manager's take on things. TBF, I wouldn't consider quitting either ... if I had another year to run on my contract! "Sometimes supporters are too quick to blame managers and their management teams. Sometimes they should take a look at some of the players"
Umm ... who signed virtually all of the players? And who picks them? "I haven't questioned myself at all"
"I know after doing it for so many years, that what we're doing is right"
"It's what we've always done and it's worked, so we will keep doing it this way"
"We need the supporters to get behind us ... Most of them have been fantastic"
"It's not going to help anybody at the club if the supporters turn on the management and the players at this stage"
A statement proven by what, exactly? "He's seen the games and knows we've tried hard ... "
The Youth team would've tried hard; why don't we just play them?
" ... and how unlucky we've been"
15 league games without a win transcends bad luck, surely? "Last time Maidenhead went down they were losing 5-0 each week, but that hasn't happened this season"
At no stage during that season did we go 15 league games without a win. At no stage did we get close to equalling club records for the number of the league games without a win (17 in the 1988/9 season) or the number of consecutive league defeats (we've currently lost nine in a row; the record is 11 in 1951/2 and 1976/7). 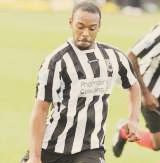 Speaking to the Advertiser this week, (Peter) Griffin insists Hippolyte will be the man in charge next season, whatever league the Magpies find themselves in. "We have only ever made one managerial appointment since we took over five years ago and that's Drax"
Hmmm ... correct, of course. Technically. Carl Taylor was in charge when Pharmalink took control of the club and I'm pretty sure he was out of contract when the aforementioned disastrous season ended in relegation. Many, including myself, thought he should've been replaced then. Without question. Instead, he was kept on. In fact, Carl told me that he was offered a contract, which he didn't sign. 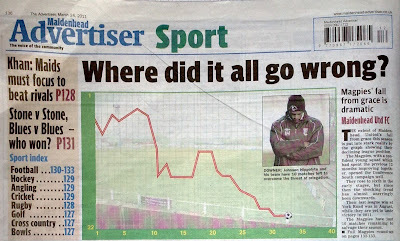 He was then sacked by the end of August after a 5-0 home defeat by Clevedon Town. Furthermore, while not a managerial appointment, the football club made a 'regal' appointment in 2008 when unveiling His Royal Highness Prince Frederick von Saxe-Lauenberg as the club's patron. As we now know, for 'His Royal Highness Prince Frederick von Saxe-Lauenberg', read Sid Halpern of Withington, Manchester. Not exactly a spotless record, then, when it comes to hiring and firing; which is why I think it's a case of 'be careful what you wish for' when it comes to those supporters who would advocate replacing Drax. As it is, I'm sure most realise that now is certainly not the right time. "Regardless of what happens he has brought a sense of professionalism to the club which is second to none"
What does that statement actually mean, in real terms, aside from the players giving each other post-match marks out of ten and supporters not being allowed on the team coach? "You only have to look at the big clubs in the division above us, and the wage bills they have, to know it's a tough level of football"
I assume this should read 'the big clubs above us in the division' (as the division above us is completely irrelevant, is it not?). If so, the clubs immediately above us are Lewes, Thurrock, Bishop's Stortford, Dorchester Town, Hampton & Richmond Borough and Boreham Wood. Hardly giants of the non league game! As for their wage bills; how do we know what they are? Guesswork, probably. The very same guesswork which leads me to believe that the likes of Steve Williams, Ashley Nicholls, Will Hendry, Sam Collins and Jefferson Louis must be getting a fair wedge to turn out for us. "I won't have anything to do with people who only look to the short-term, who are reactionary and just get rid managers when times are tough"
What about people who look to the long-term and, as such, expressed surprise when a non league football club - with average gates of just over 300 - decided it was a good idea to hand their manager a multi-year contract extension? "That's not what we are about. It's not about contracts, or anything like that"
"He's the best man for the job, working with the budgetary constraints we have"
"We will go there (Braintree) and give it a real go...Hopefully this time we can get the rub of the green, which is not something that has happened this season"
"Farnborough...are a team with a big budget"
"Chelmsford are another good team with a big budget"
Despite not having the biggest of budgets, Hippolyte is still looking to bring in some new recruits ahead of the transfer deadline next Thursday. "There are three or four who I think would strengthen the team but it's difficult to get them when you don't have the financial muscle of the other clubs"
Just a moan about injuries and referees away from the complete set of excuses! And how does bringing in three or four new players tie-in, I wonder, with 'budgetary constraints'? Peter Griffin, Maidenhead United's Chairman, is refusing to be dragged into the mire of pessimism which many think surrounds York Road. "I'm not downcast about what's happening"
"If we can get ourselves out of this situation there will be a real sense of achievement"
"It's not a disaster if we go down"
"It would be terrible, but not a disaster"
Things took a turn for the worse at the weekend as well and not just because we lost at Braintree. One of the potential signings Drax was talking about obviously turned out to be Anthony Thomas; on loan from Farnborough for the rest of the season and a goal scorer on his debut as we went down 3-1 at Cressing Road. How a 'family club' that bans it's own supporters - on the say-so of an illiterate steward - for allegedly 'attempting to bring alcohol into the ground' and 'foul and abusive language' can then pay someone to wear the shirt who has convictions for animal cruelty (over a three month period) and affray is beyond me. 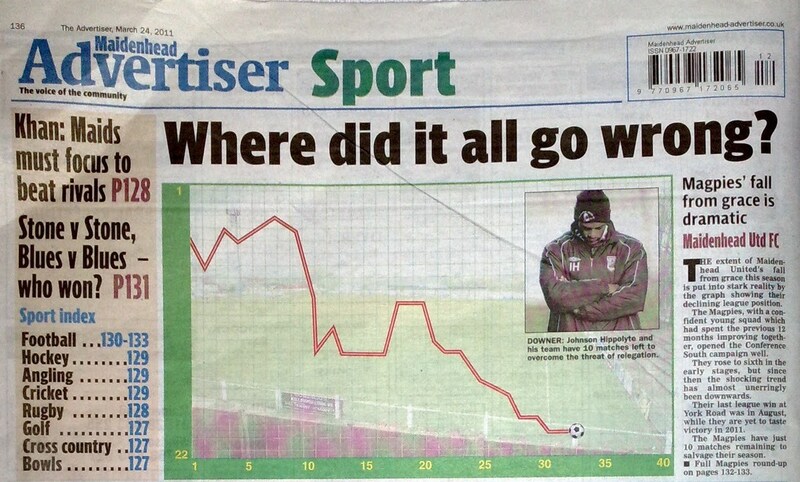 Anyway, what is the answer to the Advertiser's back-page question; where DID it all go wrong? 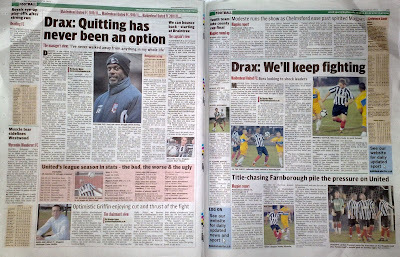 Generally speaking - remember, the Chairman won't have anything to do with people who look to the short-term - Drax's promotion side was needlessly dismantled and we've never been the same since the pathetic FA Cup capitulation at Horsham. The two-year contract extension handed to the manager, meanwhile, was IMO always going to promote complacency as much as stability. With specific regard to this season, at least one York Road regular has told me that team spirit seemed to disappear as soon as (the half-fit) Akurang and Hendry signed (the timing of which - just after we'd exited both major Cup competitions - seemed strange in itself). Furthermore, if you have little in the way of quality strikers, then why not play one upfront and pack the midfield? Speaking of strikers, KSA might not have been everyone's cup of tea, but the fact remains that he is our top goalscorer this season. Should he really have been one of the first shown to the exit door? I'm also gonna mention at this point the fact that, since one of our most vocal supporters was banned for the season at the beginning of September, we haven't won a league game at home and have won just twice in the league full stop. We went to see East Stirlingshire (who know a thing or two about losing!) play at Berwick Rangers last weekend (photos already on the GMOSC Facebook group and an 'Away Day Diary' to follow, on here, as and when I get the chance) and their Macleod (M) equivalent - who was the spitting image of David Sweeney - kept shouting "Nae sing, nae win" at the relatively decent amount of travelling support; urging them to make some noise (they didn't need much encouragement, TBF!). Now, a certain other MUFC Ltd blog will tell you that the vocal support for the Magpies this season has been good. Perhaps it has, although that blog is written by a self-styled spin doctor who seemingly cannot describe a Magpies defeat without using the words 'admirable' and 'hard-working'. Pinch of salt, then. "Nae sing, nae win" eh? You must know where I'm going with this by now ... yes, that's right, I blame Murdo!